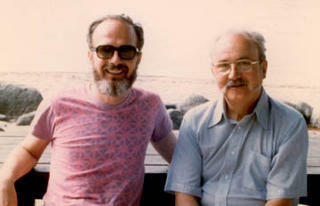 Dr. George Box is not as well known in the general management community as his ideas merit (in my biased opinion – photo of Bill Hunter and George Box). He is well know in the statistics field as one of the leading statistical minds. Box on Quality is an excellent book that gathers his essays from his 65th to 80th year. The book has just been issued in paperback (which helps as the hardback was pricey). While some of the essays are aimed at a reader with an advanced understanding of statistics, many of the articles are aimed at any manager attempting to apply Quality Management principles (SPC, Deming, process improvement, six sigma, etc.). An except from the book provides a table of contents and an introduction. Some of the articles from the book are available online. I encourage you to take a look at several of the articles and then go ahead and add this book to your prized management resources, if you find them worthwhile. Good Quality Costs Less? How Come? This entry was posted in Books, Design of Experiments, Management, Management Articles, Statistics and tagged Bill Hunter, Design of Experiments, George Box, Madison, quality management experts, Six sigma, Statistics on October 11, 2005 by John Hunter. Getting back to the question raised by the “Who Influences Your Thinking” post; More importantly I believe they (we) are just failing to get all we should. This entry was posted in Management, quote and tagged Ackoff, Bill Hunter, Brian Joiner, curiouscat, Deming, Douglas McGregor, George Box, Management, management history, Peter Scholtes, quality management experts, Six sigma, TQM, Womack on March 10, 2005 by John Hunter.